If you want a step-by-step guide on how to keep your room clean and tidy, you've come to the right place. We’ve all struggled with keeping our rooms clean at some point in our lives, and it’s completely normal to still always feel like your incapable of keeping your room clean and organised. It can sometimes feel like the hardest mission in life is cleaning and tidying your room, when, in reality, it’s one of the simpler things in life. Just take it step by step and before you know it you will be a pro at knowing how to keep your room clean, at all times. No excuses! In this post we will go through the main steps of how to keep your room tidy, organised and how to eventually develop these good habits with ease. Follow RubandScrub’s simple, detailed steps to have a sparkling clean room without a spec of dust in sight. Remove all rubbish. Get a bin-bag and collect all the rubbish you have in your room. Check under your bed and under your desk. When you’re finished with this step, there should be no litter in sight. Get rid of all food. 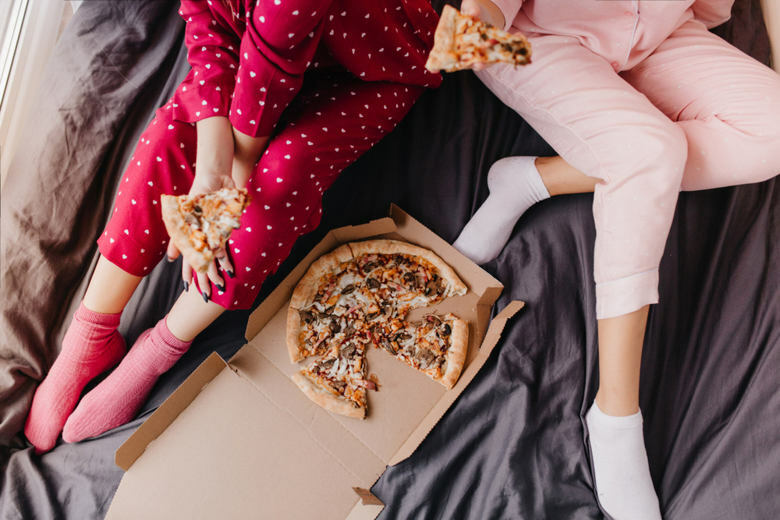 That leftover pizza from yesterday should not be sitting in your room, building up nasty smells in your sleeping space. Get rid of all food that is in your room – bacteria can grow on food and can infest your room with all sorts of flies and bugs (aka unwanted guests). Time to hoover. This is one of the most important steps in our ‘How to Clean your Bedroom’ guide. Be sure to remove everything from your floor. Don’t just hoover around your clutter – this is a big mistake that many individuals often make and is not a smart cleaning method. If you have any stains on your carpet, use this helpful guide on removing tough carpet stains. Store everything that doesn't need to be on show, away. This is to make sure your room is tidy before you complete the next step. Dust everywhere. 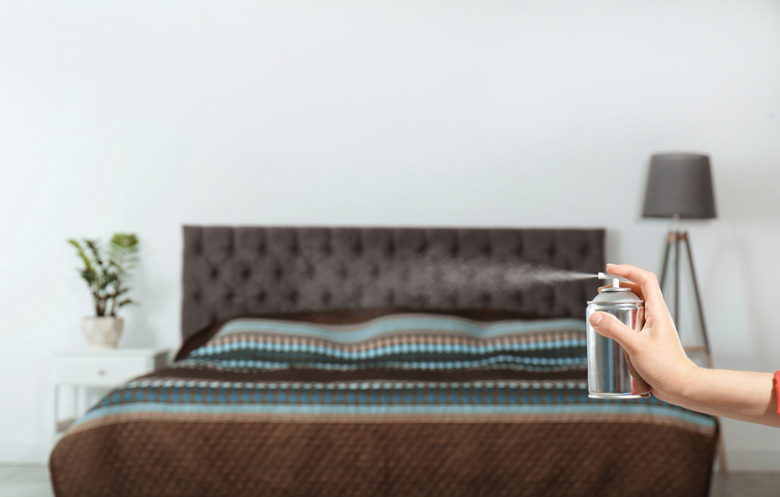 Proceed with your dusting – use a clean cloth and a pleasant-smelling dust spray which will easily take care of all the allergens and dust in your bedroom. 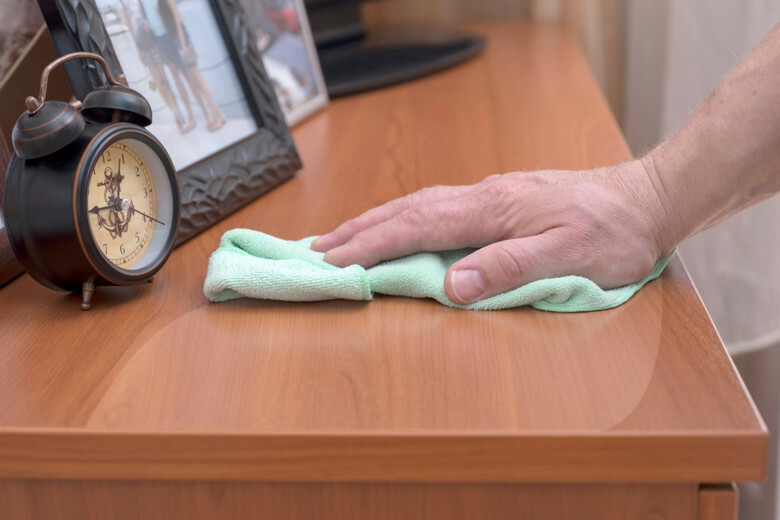 Make sure you wipe down all your surfaces which collect dust and dirt – your TV, laptop, lamp and stereo are no exceptions. Your room, by now, should be looking pretty clean, but we aren’t done yet! If you want to be a real whizz at cleaning, you’ll follow these last few essential steps, which will make sure that your space is sparkling. Change your bedsheets. Bedsheets are one of the household items that make you unwell if they are kept unwashed for a long period of time, so make sure you change them often. It’s true, however, that no one really enjoys this step – it’s a constant struggle when trying to fit your bedsheets to your bed. But who doesn’t want fresh smelling sheets to match their super-squeaky-clean room? Clean windows/mirrors. Wipe down your mirrors (with a glass cleaning spray) so you can see a streak-free reflection when doing your hair or taking that mirror selfie! Also, if your windows aren’t looking their best, why not give them a clean on the inside with a glass cleaner? It’s a quick and simple step, but if you’re looking to do a ‘deeper’ clean, why not clean the windows from outside if you’re on the first floor? Or, alternatively, you could hire a company to clean your windows for you! Clean your ceiling. Spiders love to settle up on your ceiling! Get rid of dust and spider-webs that could have formed on your ceiling. Do this by reaching up with a broom or hoover. This is not a necessary step every time you decide to clean – just when you see a build-up of something on your ceiling or walls. Get rid of bad smells. This last step in will guarantee your room not only looks, but also smells, the part. Why not buy a plug-in air freshener that could keep your room constantly smelling fresh for up to 3 months? Or you could simply use an air freshener spray to spray your bedroom with. And voila, there you have it – all the thorough steps you can take to keep your room clean. Keeping your room clean AND tidy comes hand in hand and they aren’t exactly the same thing. Knowing how to keep your room tidy involves remaining organised and not allowing any clutter to build-up. Essentially, you want your room to look neat. So here are the main steps you need to take to keep your room in order. Make your bed. Making your bed makes such a big difference to your room, it definitely will make at least one section of your room look neat and tidy. And let’s be honest, this step takes no longer than a minute, so no excuses. Open your blinds. This step is crucial, letting in light into the room you spend most time is a good step to take. Having natural light in your room will automatically make your room look better and will let in some vitamin D from the sun which is beneficial for your overall health. Obviously when it’s dark you can close them. Or if you’re not in the mood for light you can skip this step, but it does make a huge difference in improving your room’s appearance. Declutter. Remove all things that don’t need to be ‘on show’ in your room. This is a pretty self-explanatory tip for keeping your room tidy. Put your clothes away in your wardrobe, they don’t need to be lying around your room, creating unnecessary mess, especially if you’ve just cleaned your room and followed the ‘how to clean your room’ tips. Manage your drawers. Ensure that your drawers are organised and that no needless objects take up the space you have in there. Only keep useful things in your drawers. Bonus tip: you could get drawer organisers that you can put into your drawers to keep them in a proper order. Start with always making your bed in the mornings before you leave for school or work – you’ll thank yourself at the end of the day when you come home to a beautifully made bed – ready for you to wrap yourself in. Always put your clothes away in your wardrobe. It can be hard if you’re in a rush but ensure that you leave at least 5 minutes dedicated to putting things away before you leave your home. Remove all rubbish from your room and try not to eat in your room, if you can. This will ensure that no germs and bacteria are built up and your room is left with no funky smells. Remember, if the rooms in your house are clean and tidy – your life will feel more organised and less stressful. So, try and make these helpful habits stick! Remember that RubandScrub can help you with any type of cleaning that you require. Don’t hesitate to contact us if you have any queries.